Hidden World (ヒドゥンワールド Hido~unwārudo) is the eighth world of Sonic Lost World, and is exclusive to the Wii U/PC version of the game. This abstract world is unlocked after completing the game. In this Zone, the player starts on a large colorful cube where the boxes with eyes pop up on each side of it and within a time limit of 30 seconds. The boxes flips over tiles after a few seconds, which could harm Sonic if touched. 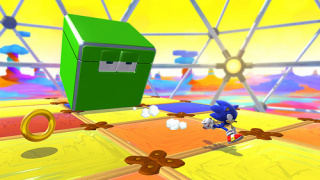 In order to destroy a box, he must use the Homing Attack on it until it moves off the edge of the cube in order to save an animal, adding 10 more seconds to the time limit and allowing him to move on to the next side of the cube. To end the Zone, the player must let time expire. This Zone has Sonic ride atop the Tornado, steering around Badniks (from Sky Chase Zone, no less) and make it to the finish in time, collecting time bonuses and speed boosts along the way. If the Tornado hits a wall dead-on, Sonic will be thrown off the Tornado, resulting in death. Sonic is back on foot for this techno-themed Zone, and he must progress through a tube full of tiles to clear the stage. Tiles lined with cyan will shrink when stood on, and tiles lined with yellow will move forward until they hit an obstacle and disappear. The final Zone of this level is an auto-scroller that has Sonic travelling across bubbles containing spike balls with their own gravitational pull. When he jumps from them, they pop, shooting the spike balls in the opposite direction of Sonic's jump. When Sonic jumps, he will continually fly in the direction of his jump, stopping on any bubble in his path, but if he flies to the edge of the screen, he will be killed. After a while, he will come across bubbles containing fuzzy orange and white creatures known as Baku Bakus that will chase him once released, and must be defeated using the spike balls. After a while, a giant Baku Baku will appear, and Sonic must defeat it by shooting spike balls into its mouth. Zone 2 plays an instrumental cover of "Believe in Myself" from Sonic Adventure 2. The Baku Baku enemies bear an uncanny resemblance to Pac-Man, a famous icon in video gaming and the flagship character of Namco. This page was last edited on 8 April 2018, at 07:47.